How to print the worksheets in spreadsheet? Spreadsheet Control allows you to print the worksheets in spreadsheet by using the GridControl Printing Support. The Print Preview feature of GridControl populates a print dialog that allows you to preview the output and make required modifications if necessary, before sending the content for printing. You can invoke the Grid Print Dialog box using the following Code example. Click the Print button to send the content to the printer for printing. 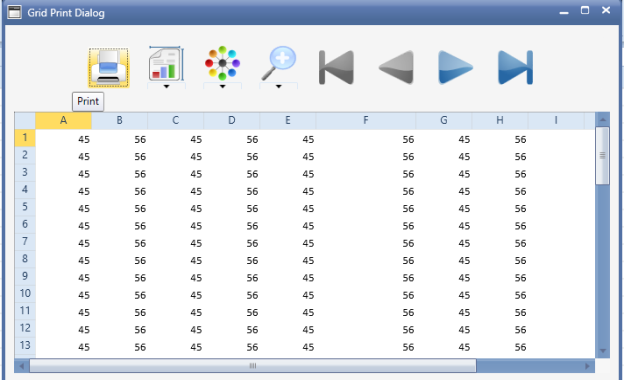 The Print feature in GridControl allows you to directly print the content in Spreadsheet Grid. The following code illustrates the direct printing in Spreadsheet Control.